Ocean Paradise, which is currently for sale, is a yacht that is all at once personal and has the owner's wishes indelibly stamped on the interior, but also perfectly friendly for charter for which she is planned. Izzo describes the owners brief as, ‘to be cool, contemporary, fresh and above all original. He specifically asked us to arrive at solutions that represent something different from what you usually see in ports or in magazines. 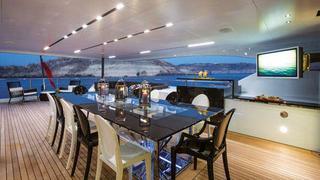 While yachts, out of necessity, must have enclosed spaces, Izzo responded with a plan that does not feel enclosed. To achieve this, he employed light woods, unorthodox lighting, and glass for interior walls. ‘A skylight connects the main deck with the upper deck in the centre of the outdoor dining table, which is itself made of transparent material,’ says Izzo. ‘[And] we made the windows of the saloon full height and lowered the height of the bulwarks to allow guests to enjoy remarkable sea views while sitting on the sofa. The master suite, with its fixed balcony that can be enjoyed even while the yacht is moving, is another example of visual communication and harmony. The bulkhead separating the cabin and the bathroom is clear glass, resulting in the perception that the two areas are much. The bed is made of white leather and is accompanied by black leather bedside tables. All the furniture appears to be floating thanks to hidden supports and diffused LED strip perimeter lighting. 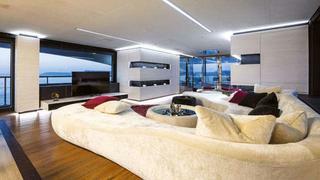 Indeed, in all the cabins, as elsewhere on this yacht, the furniture seems to float upon light above the thick carpet. The joinery throughout the accommodations is oak in both natural and coloured finishes. In some areas it is blackened with a special process that lets one see and feel the grain. Leather, ranging from alligator to colourfully stained pony hide, has been used on a massive scale. All the headboards and cabin ceilings, for example, are in leather with double stitching in contrasting colours, recalling the style adopted by Lamborghini. Another reminder of automotive design is on the bridge, where a ‘love seat’ exactly mimics the bench seat in an early Ferrari. 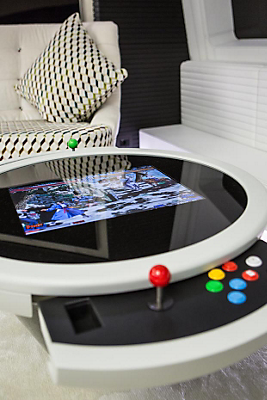 The owner is from Singapore and collects vintage video games, so the upper saloon features a table for a 1980s gaming console that runs games and has retro joystick and knob controls. The bar forward of the gaming table is made of onyx – which appears to be a source of light thanks to carefully hidden sources of illumination. The VIP cabin on the upper deck has two large artificial skylights, within which are RGB LEDs that enable the occupants to create any colour of mood lighting, while the windows offer an excellent sea view that can be enjoyed from the bed. On the lower deck, two of the four guest cabins have Pullmans with a custom mechanism; when in use the bed appears to float yet it folds away unseen when not in use. 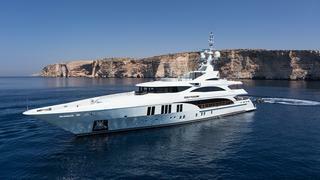 The yacht is equipped with BEST, Benetti’s monitoring and control system that manages all electronic functions, integrates with iPads, and enables the yard to create attractive and functional helm areas. The one on _Ocean Paradise _is a superb example. The console itself stands clear of the forward bridge bulkhead, which gives easy access to the electronic components and allows the helmsman or watchkeeper to stand close to the windscreen if desired. The console and navigation island are away from the heat that can be generated by tropical sun on glass. The vertical bridge windows and ample overhangs also help keep the area cool. 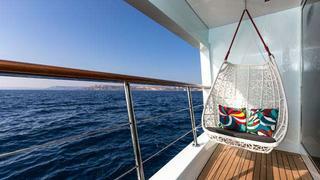 Aft of the saloon is a capacious outdoor area sheltered by the sun deck’s overhang. 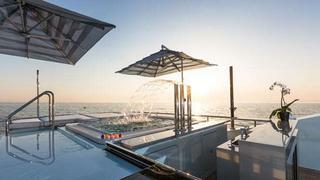 The sun deck is intended to be a terrace overlooking the sea. Here a spa pool is surrounded by a large sunpad, while nearby is a carbon fibre wet bar. A seating area under the communications arch includes coffee tables, and further aft, glass panels can be slid into place as a barrier against the wind. Behind these is a gym and a large relaxation area in the sun with chairs and tables. 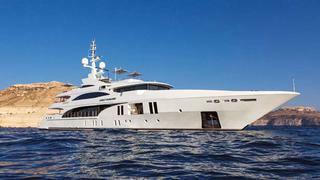 The beach club is accessible from either the bathing platform or stairs from the main aft deck. A section of the transom opens to make a larger deck and reveals a shaded lounging area just above sea level. The side-opening garage houses a large tender that is stowed athwartships and launched by an overhead crane. The rescue boat and personal watercraft are stored on the bow. The crew’s cabins (five doubles and one single), mess and galley are generously sized because the laundry and substantial cold storage are on the machinery deck below. 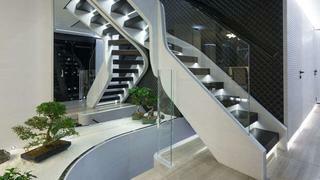 The yacht’s well-planned crew circulation paths and double stairways are of a type found mainly on larger yachts.